Hansberry based her story on her personal history, setting it in Chicago’s Woodlawn neighborhood. It tells of a family, newly possessed of the father’s $10,000 death settlement, who try to work their way out of poverty. The New York Drama Critics’ Circle named it the Best Play of 1959. The 29-year-old author of the first play written by a black woman to be produced on Broadway, became the youngest American playwright to receive this award. A Raisin in the Sun was also the first play on Broadway with a black director, Lloyd Richards. Moving to New York in the early 1950s, Hansberry worked for the New York based Pan-Africanist newspaper Freedom, where she interfaced with intellectuals such as its publisher Paul Robeson and W.E.B. DuBois. She did clerical jobs in addition to writing news articles and editorials. She covered Southern lynching cases and civil rights, and also global struggles against colonialism and imperialism. She often saw these struggles through the eyes of female participants. Veteran actor Starletta DuPois is worth the price of admission alone. In recent years she has appropriated the role of Mama Lena Younger, but the first part she played in Raisin was the daughter Beneatha, and later the daughter-in-law Ruth. DuPois may be the only actor ever who has played all three female roles. As Mama she carries the weight of centuries of African American survival, using her generations of history up from slavery, her stolid dignity in the face of those who would demean her, her rock-solid faith, and her earned matriarchal status to try and keep her brood in line. Mama is challenged by the frightening new ways of her children, with their own plans and dreams in life, but she has not forsaken her own long-cherished dream. The scraggly, sun-deprived potted plant she has kept gasping for breath on her windowsill may yet see a brighter day when she is finally able to move the family out of her tenement – “acute ghettoitis” in Beneatha’s words – and into a new development with a yard. DuPois swallowed Raisin whole way back when the new play landed in Philadelphia for pre-Broadway tryouts, and she has internalized every nuance and inflection, every social, cultural and historical resonance that can possibly be extracted from its precious words. The Youngers had two children. The 20-year-old Beneatha (Charlotte Williams) aspires to become a doctor, wanting to fix and heal. She has rejected her Mama’s unquestioning faith in God, transferring her belief over to science, education and reason. She is quite the live wire, a smart and sassy young woman fully aware of her attractive vitality that has her juggling two suitors. Hansberry is so smart and so prescient. She has the upstart Beneatha experimenting with African tribal garments, native Yoruba dance, and shockingly, allowing the forest of rich nappy curls on her head to blossom and shine. In those days natural was “eccentric.” The playwright had her ear to the ground in 1959 listening to the new mood bubbling up among the young Black American cognoscenti. Already she articulated, mostly through this character, who seems to be her alter ego, an appreciation for dialectical analysis, dismantling concepts such as assimilation and nationalism. The year 1959 marked the first wave of decolonization, before most of the African countries achieved their independence. Yet might there then be the chance of corruption on the part of the new leaders in Africa? Yes, there would, and possibly honest intellectuals who fought against colonialism would suffer. But these problems would have to be worked out by social forces on the ground once the colonial masters leave. These were the kinds of debates that preoccupied the Freedom magazine circles. The daughter’s suitors include George (A.J. Davis), a callow college fraternity dandy focused only on material success and conspicuous display, and Joseph Asagai (Mohirah Hall), an idealistic young Nigerian of the rising professional class. But Beneatha openly defies her mother, boldly hinting she may never get married – scholars have identified Hansberry as a lesbian, and sexual freedom is an important topic in several of her works. Both George and Asagai contrast sharply with Walter Lee Younger (Redaric Williams), the son and now patriarch of the family, who sees the future not in education, nor in politics, nor in the soul-crushing laborer’s work that defined his late father. Tragically, wastefully emasculated as a lowly chauffeur, Walter Lee instead sees success in gambling on a liquor store or some other get-rich-quick scheme that will enable him to place pearls around his wife’s neck. He has learned to divide the world between those who take and those who get “tooken,” and he’s tired of being tooken. His struggle, to realize the dreams of his family, to assert his manhood, to be a father and lead with dignity and a head held high, is the central problem of the play. Tarina Pouncy played Ruth with the pitiable forbearance of a woman deeply in love with her troubled Walter Lee, admiring his “Promethean” potential but not even beginning to know the depths of his despair as a man. It is through the wise counsel of Mama Lena that the family learns to love a person when he’s at his lowest, and that love becomes the turning point. Jaden Martin plays Walter Lee and Ruth’s spunky teenage son Travis. Karl Lindner (Josh Drennen), the sleazy Clybourne Park representative of the “Welcoming Committee” trying to buy out the Youngers to prevent them from moving into their new home in the exclusive enclave, ironically represents an Aryan identity (judging from his name) that has a far shorter history in the U.S. than the six-generation Youngers have. 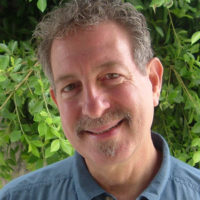 Kudos to the sound designer Chip Bolcik, who who uses apt music from the African American songbook to point up the blues and laments of life in the Jim Crow era. The house Mama Lena purchased at the fictional 406 Clybourne Park has become a palpable symbol of racial migration in the effort to capture a ray of the American Dream. 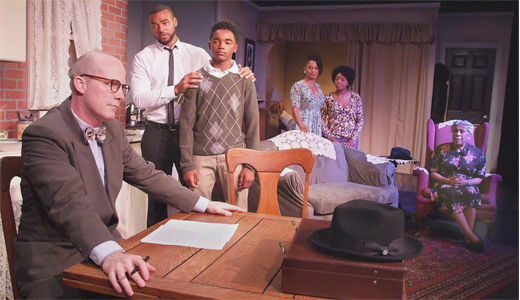 Playwright Bruce Norris has since written a “sequel,” called Clybourne Park, which brought the story up to the present (and won the 2011 Pulitzer Prize). Director Lita Gaithers Owens, a Tony Award-nominated playwright and co-author of the Broadway musical It Ain’t Nothin’ But the Blues, is convinced, rightly, that A Raisin in the Sun “continues to speak to the racial issues that are facing our country today. The American Dream, for some in this nation, comes after enormous perseverance and tenacity. But for many, it simply doesn’t come at all. So, what can be discovered by taking a look from the view of those who get weary while waiting on the manifestation of their dream?” Owens has used Hansberry’s text to bring to life the different shapes of African American dreams, some of which have been realized since the playwright’s day, at least in part, others sadly still deferred. Attempts by newly re-energized racist forces today to turn back the clock on what progress we have made remind us that victories are only temporary and must be vigilantly defended. If by some chance you are unfamiliar with this play, it’s time to get to know it. Those who know it will find this a fresh, intimate and revelatory production. A Raisin in the Sun plays at the Ruskin Group Theatre, 3000 Airport Ave., Santa Monica 90405, Fridays and Saturdays at 8 pm and Sundays at 2 pm, through Sept. 17. For more information, call (310) 397-3244 or visit www.ruskingrouptheatre.com. Photo: Josh Drennen, Redaric Williams, Jaden Martin, Angelle Brooks, Charlotte Williams, and Starletta DuPois. In the August 26 performance Tarina Pouncy played the role of Ruth (third from right) / Ed Krieger.